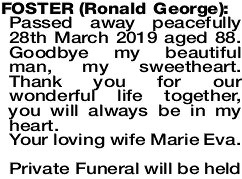 Passed away peacefully 28th March 2019 aged 88. Goodbye my beautiful man, my sweetheart. Thank you for our wonderful life together, you will always be in my heart. Your loving wife Marie Eva. Your love was great, your heart was kind. 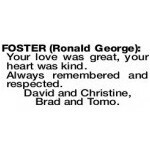 David and Christine, Brad and Tomo. 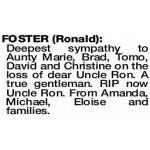 FOSTER RONALD Deepest sympathy to Aunty Marie, Brad, Tomo, David and Christine on the loss of dear Uncle Ron. A true gentleman. 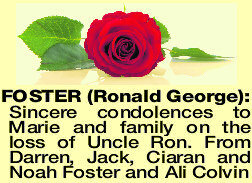 RIP now Uncle Ron. 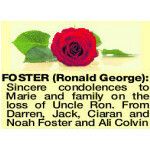 From Amanda, Michael, Eloise and families. Passed away 28.3.2019. 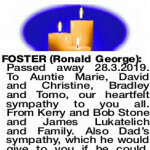 To Auntie Marie, David and Christine, Bradley and Tomo, our heartfelt sympathy to you all. From Kerry and Bob Stone and James Lukatelich and Family. Also Dad's sympathy, which he would give to you if he could. Bye for now Uncle Ron! Our thoughts are with dear Marie on the passing of this special man. 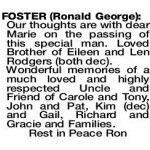 Loved Brother of Eileen and Len Rodgers (both dec). 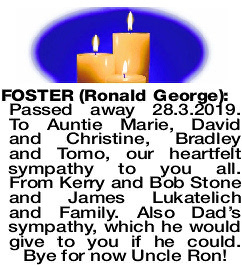 Wonderful memories of a much loved and highly respected Uncle and Friend of Carole and Tony, John and Pat, Kim (dec) and Gail, Richard and Gracie and Families. Dear Marie, all our love, thoughts and support are with you. Ron will always be remembered as a true gentleman. Your Art Tarts.